How often do you find yourself taking a shot of a subject with the wrong lens? If you are an opportunistic wildlife shooter like I am, it happens pretty regularly. 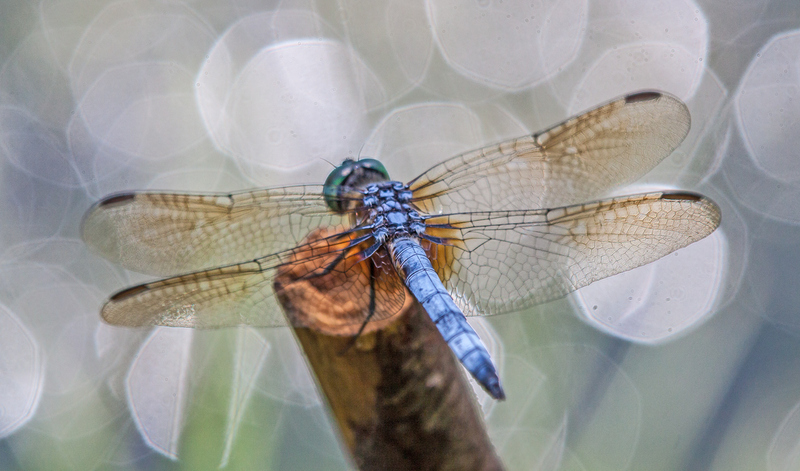 At this time of the year, most of the time I have a macro lens on my camera and I focus a lot on insects. 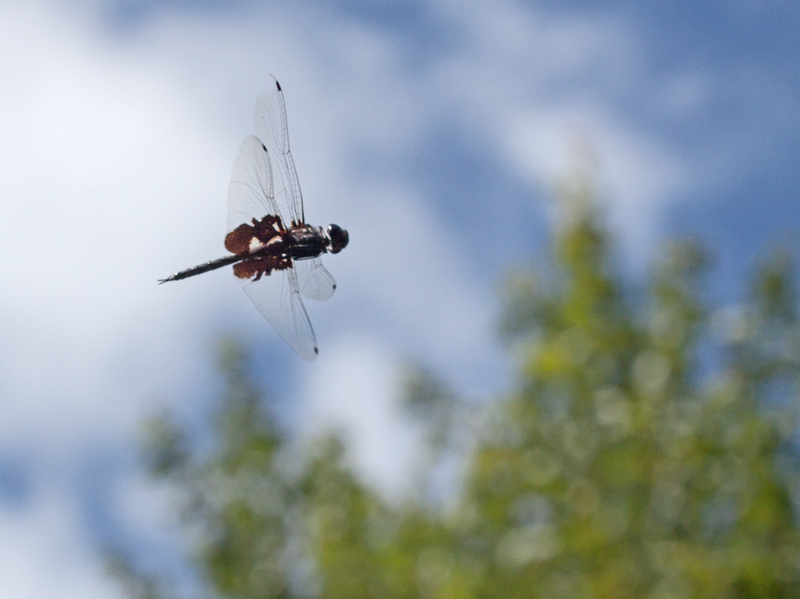 Earlier this week, I was attempting to photograph a dragonfly with a 100mm macro lens when I heard the squawking on an approaching bird. Thinking perhaps that it was a hawk, I raised my camera and clicked off a series of shots as the bird flew by on the other side of a small pond. 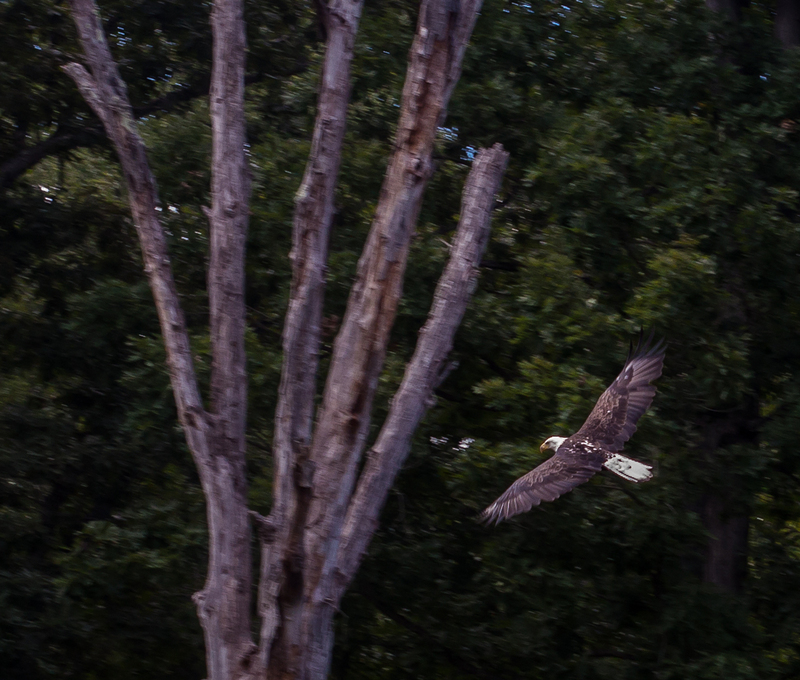 Imagine my surprise when I looked at my images and realized that the bird was actually a Bald Eagle (Haliaeetus leucocephalus). 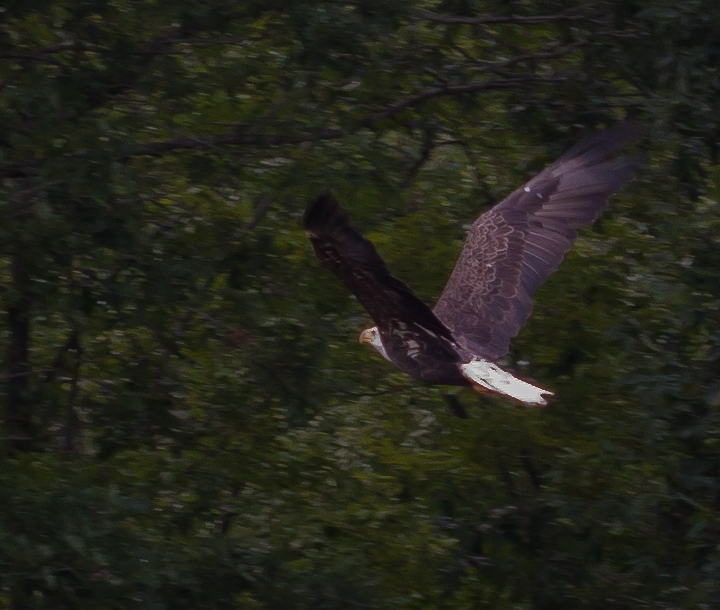 There is something really special about Bald Eagles and I am thrilled every single time I see one. Even with a crop sensor camera, a 100mm lens is not the right lens for shooting birds in flight at a distance, especially against a background of trees. I am posting a couple of shots simply to show that it is sometimes possible to get recognizable images of cool subjects even when the conditions and equipment are not optimal. The images are also a reminder to myself to keep shooting and not wait for the perfect conditions to come together. If I wear out the camera, I can always get another one. Am I the only one who remembers a poster from the 1970’s featuring the slogan “Fly United” and depicting two ducks mating in mid-air? That’s what immediately came to mind earlier this week when a pair of Great Blue Skimmer dragonflies (Libellula vibrans) flew by me at my local marsh. Anyone who has ever watched dragonflies mate knows that it is an acrobatic endeavor, requiring tremendous flexibility by both parties. Imagine trying to fly while still in the “wheel” position. Amazingly all of the wings seemed to able to move freely, though I didn’t notice if they were both using their wings for propulsion. 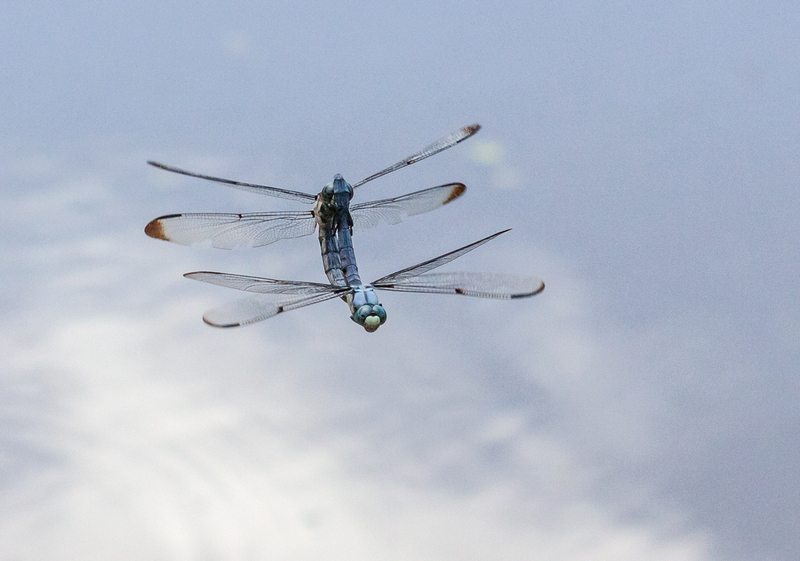 I was able to snap off these shots as the pair flew toward me over the water of a pond, which reflected wonderfully the blue sky and the clouds up above us. 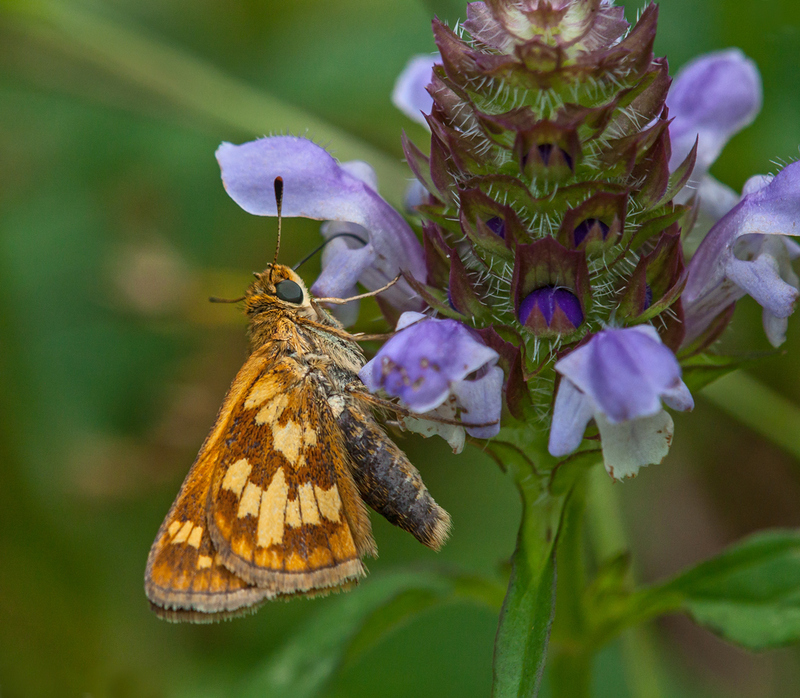 A handsome little skipper feeds on a gorgeous purple flower and the result is simply beautiful. 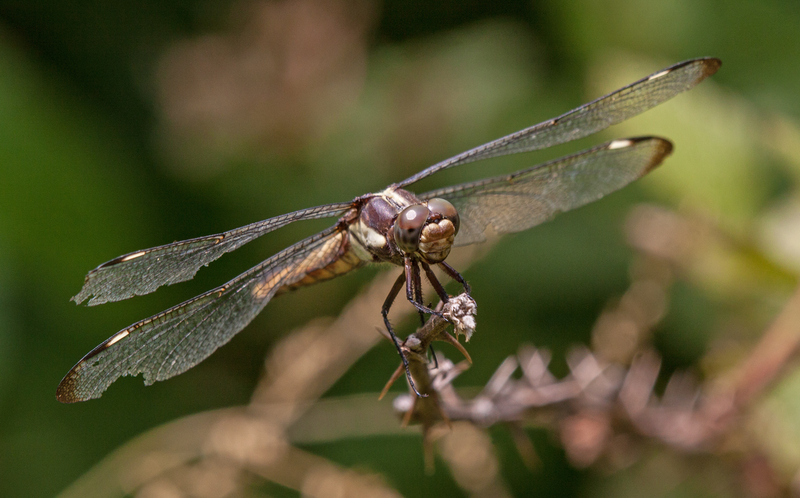 Normally when I think of saddlebags, I think of cowboys and the Pony Express, but there is also a species of skimmer dragonflies known as Black Saddlebags (Tramea lacerata). Someone obviously thought the dark patches on the hind wings looked like saddlebags. 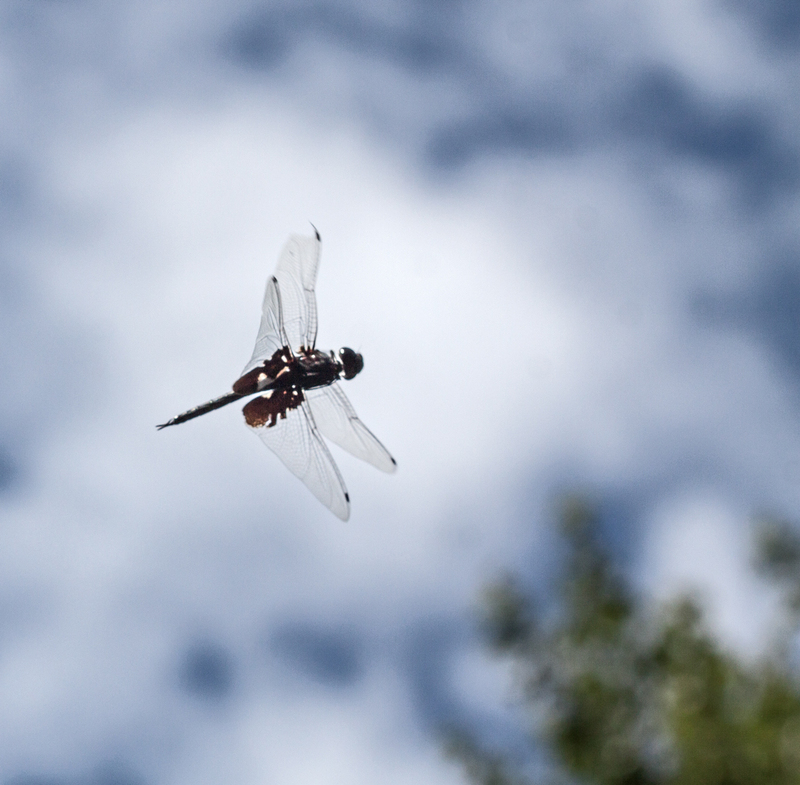 Unlike many of the dragonflies that I often observe, Black Saddlebag dragonflies like to fly high in the air (and not low over the water) and some of them even migrate. 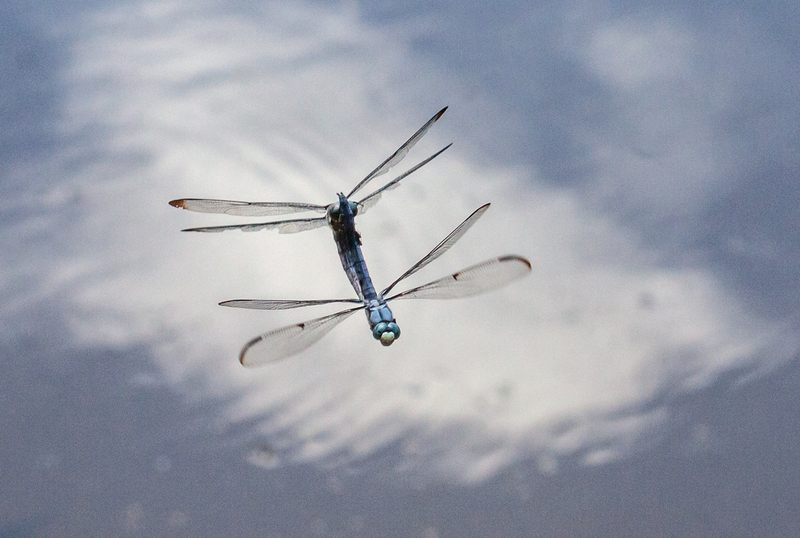 I was alerted to their presence at my local marsh by a recent posting by a local dragonfly expert and fellow photographer Walter Sanford, so yesterday I kept one eye to the sky yesterday as I searched for subjects to photograph. 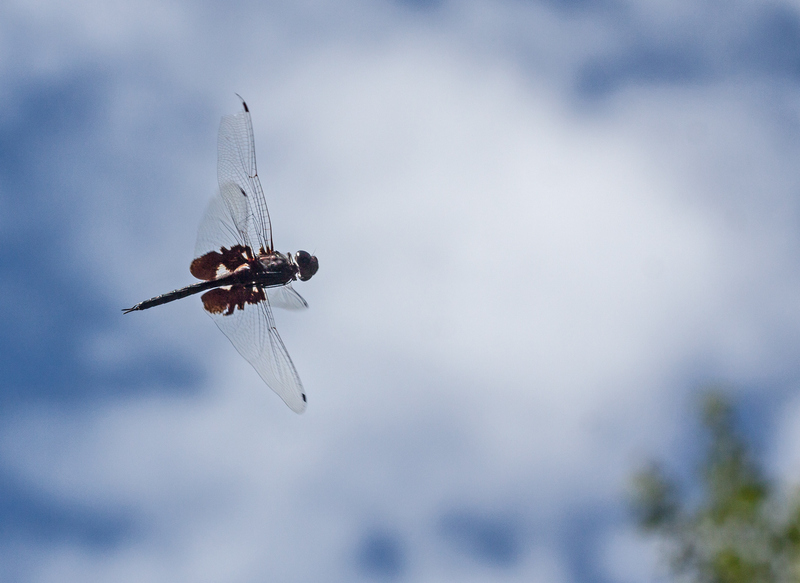 Black Saddlebags flew over me several times and I was fortunate to get some shots of one of them in flight. It might have been nice to have used a longer lens than the 100mm macro lens that I had on my camera at the time, but the shots turned out pretty well nonetheless. The first image is the sharpest image, but I like the entire sequence of the three images and the way in which they convey a sense of the environment in which I was shooting. 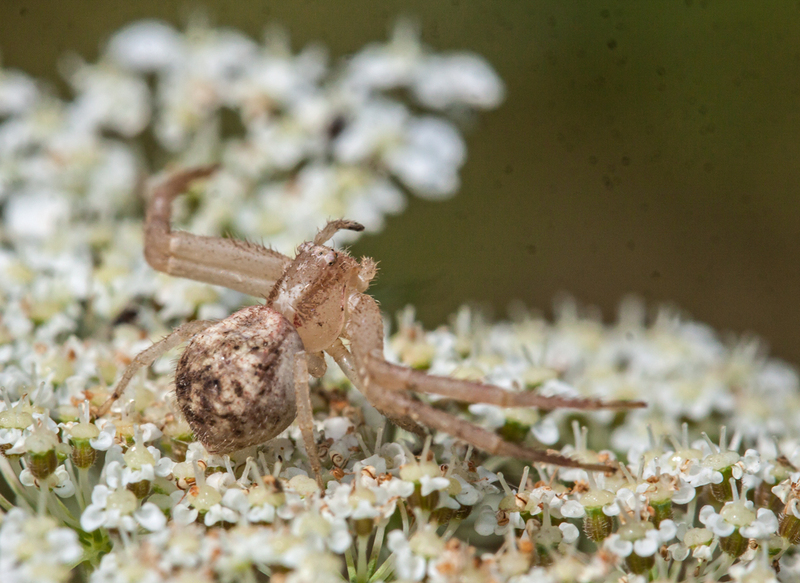 One of my fellow photographers pointed out this cool little crab spider on some Queen Anne’s Lace (Daucus carota) during a photo jaunt to Meadowlark Botanical Gardens in nearby Vienna, Virginia this past Saturday. 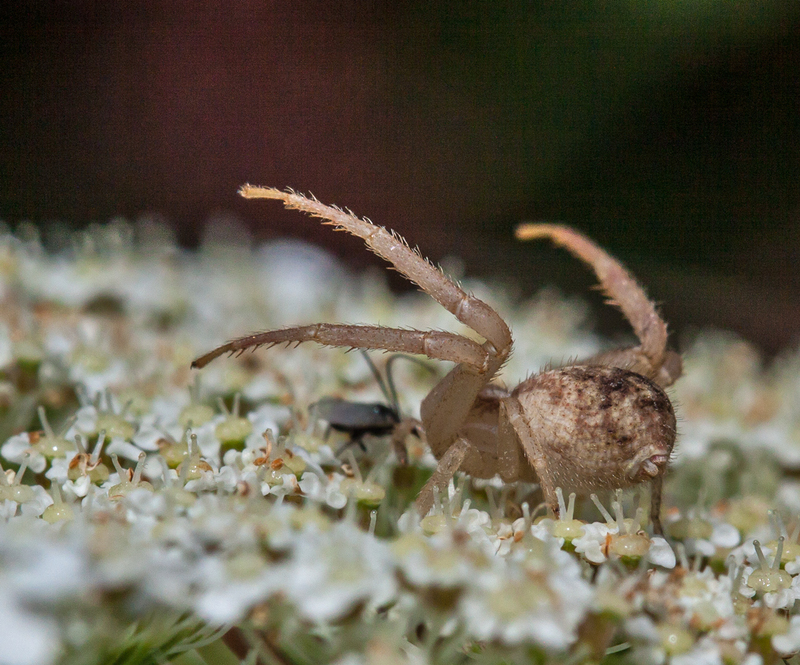 In this first shot, my favorite, the spider seemed to be expressing frustration that his prey had escaped his grasp (or simply wanted to show me his awesome biceps pose). 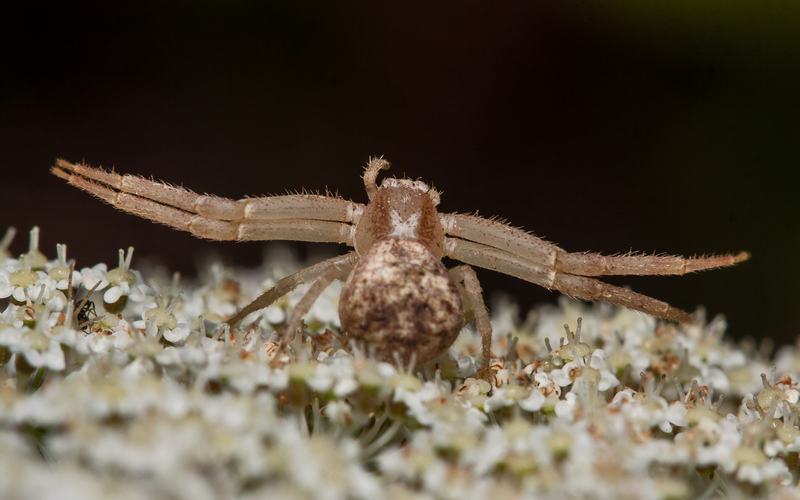 Who knew that spiders have biceps? Initially I tried to photograph the spider looking down at it, but I had trouble maintaining a steady pose and my shots were blurry. I decided to kneel down and get at eye level with the spider, looking across the plane of the flower, and that seemed to work a bit better. These shots look like they were done with flash, but the EXIF data shows a shutter speed of 1/320, which is higher than the synch speed of my flash, so these were actually done with natural light, with some exposure compensation dialed in. 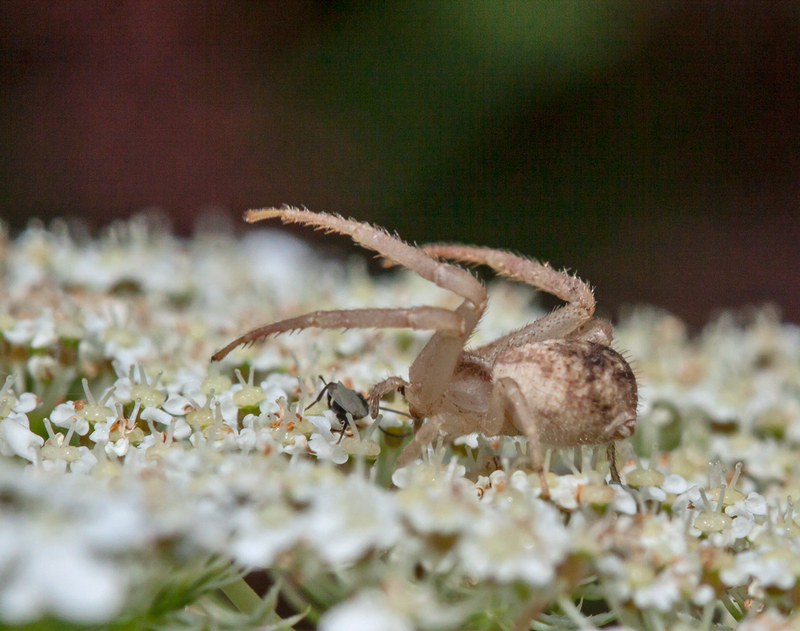 The second shot, which preceded the first one in time, shows the spider trying to capture a small insect (I think). The little insect starts to run away. In vain, the spider crawled after the small insect, but it was too late. When I left the spider, it was at the edge of the flower, looking off into the distance, pondering perhaps what might have been, thinking about the one that got away. 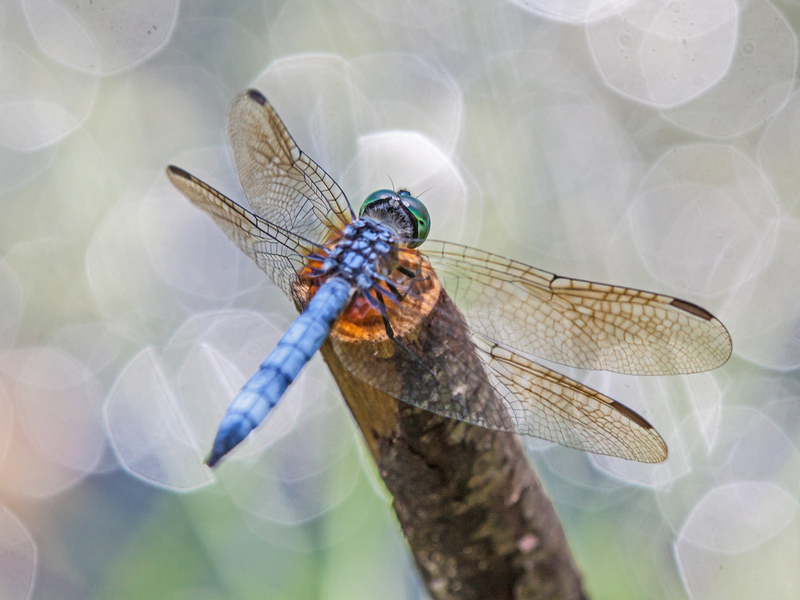 The light reflecting off the water in the background was really bright, creating these disco ball highlights when I took these shots of a male Blue Dasher dragonfly (Pachydiplax longipennis) recently at Green Spring Gardens. Normally I try to avoid distinctive specular highlights, but in this case I decided to embrace them. Why do I suddenly feel an irresistible urge to watch Saturday Night Fever? Have you ever found yourself in a thorny predicament? Last weekend, I came upon this female Spangled Skimmer dragonfly (Libellula cyanea) that had literally placed herself in such a situation. 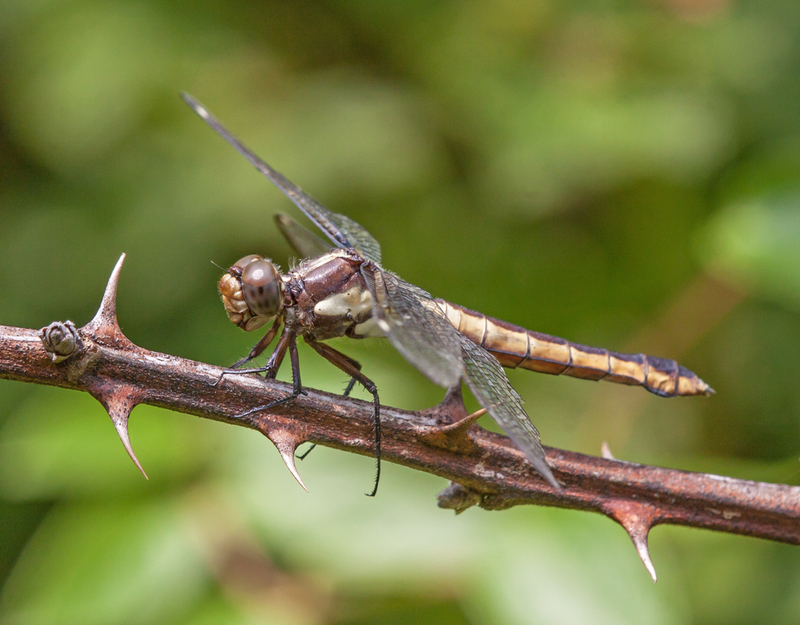 Fortunately, dragonflies are so small, lightweight, and agile that she was able to place herself in between the thorns, out of harm’s way. If you look closely at her wings in the second image, however, you’ll see that they are tattered, suggesting that it’s been a tough season for her, probably as a result of predators, including overly aggressive male dragonflies.